Property 52: Fire Escape Cabin-Fun Fire Department Theme ! 12 miles to Yosemite gate! Take a break from the hectic life and discovery the tranquility of the country. Property 56: Take a break from the hectic life and discovery the tranquility of the country. Yosemite's Big Rock Cabin - Less Than 2 Miles from the South Gate! Property 58: Yosemite's Big Rock Cabin - Less Than 2 Miles from the South Gate! Yosemite Nutter Ranch —A 10-Acre Spa Retreat! Property 60: Yosemite Nutter Ranch —A 10-Acre Spa Retreat! Yosemite Falls - Get Your Nature On! Property 61: Yosemite Falls - Get Your Nature On! Large Beautiful Bass Lake-Yosemite Cabin Sleeps 10! Property 63: Large Beautiful Bass Lake-Yosemite Cabin Sleeps 10! INSIDE THE PARK! 3 BEDROOMS, NEW CENTRAL A/C, WIFI, HUGE DECK, ROCK FIREPLACE! Property 67: INSIDE THE PARK! 3 BEDROOMS, NEW CENTRAL A/C, WIFI, HUGE DECK, ROCK FIREPLACE! Cedar Peak House - A perfect place to escape near Yosemite! Property 68: Cedar Peak House - A perfect place to escape near Yosemite! Our Yosemite Getaway - Get Your Nature On! Property 72: Our Yosemite Getaway - Get Your Nature On! NEW! Mid Century Mountain Retreat near Yosemite! Property 78: NEW! Mid Century Mountain Retreat near Yosemite! Inside Yosemite N.P. Gates!, our luxury home is minutes from valley attractions. Property 81: Inside Yosemite N.P. Gates!, our luxury home is minutes from valley attractions. Yosemite Silvertip Lodge - Just minutes from the South Entrance! Property 85: Yosemite Silvertip Lodge - Just minutes from the South Entrance! The Legacy - Get Your Nature On! Property 87: The Legacy - Get Your Nature On! Yosemite Mountain House: Frank Lloyd Wright Meets Yosemite, One-Night Stay Okay! Property 93: Yosemite Mountain House: Frank Lloyd Wright Meets Yosemite, One-Night Stay Okay! 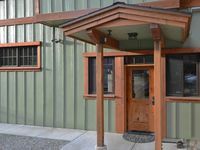 Wawona Chalet - Get Your Nature On! Property 99: Wawona Chalet - Get Your Nature On! Great place, close to Yosemite! My son and I decided to make a weekend of going to Yosemite and hitting some of the trails. I was so pleased to find Dan and Judy's Bunkhouse. It was affordable and conveniently located. That wasn't all though, the Larsens are great hosts, greeting us, even upon our late arrival, giving us tips, and even leaving us a snack of freshly baked delicious cookies. The bunkhouse itself was as described, modest, clean, spacious. It fit our needs perfectly and I hope to visit both Yosemite and the Larsens again very soon!